Few figures inspired reverence among the English and fear among the French during the Hundred Years War like the eldest son of Edward III, known to history as the Black Prince. Born June 15th, 1330, he was known early in life simply as Edward of Woodstock, named for the place of his birth. The young Edward, who possessed the striking blond hair and blue eyes of his Plantagenet forebears, was said to be strong-limbed at birth, and those who knew him were sure he would grow up to be a great warrior. Edward of Woodstock among the first English princes to hold the title Prince of Wales. His great-grandfather Edward I had wrested the title from the Welsh during a succession conflict and given it to his son, the ill-fated Edward II, from which it passed, mostly from generation to generation, until the present day. In addition to that title, he was also variously known as the 14th Earl of Chester, the 1st Duke of Cornwall, and Prince of Acquitaine. When Edward III and his son returned from France, fresh from a series of victories, the king formed the now-famous Order of the Garter in the 1340s; the young Prince Edward was one of its first twenty-five members. The beginning of Prince Edward's major military exploits came at the Battle at Crécy in 1346. Dressed in black armour given to him by his father, Edward commanded a wing of the English army (with considerable help from experienced warriors like the Earls of Warrick and Oxford, Sir John Chandos and many others) in the first major pitched battle of the Hundred Years War. The nickname "Black Prince," first seen in the 16th century, seemingly comes from his choice in armour colors and from his use of black in heraldic devices, though some claim it resulted from his foul temper. Edward's renown grew ten years later when the 26 year-old prince led the outnumbered English army as they again defeated the French, this time at Poitiers. He would continue to have success in smaller conflicts in France and in Spain (fighting on behalf of Pedro the Cruel), though the success at Poitiers was arguably the peak. Nonetheless, his fame in his home country never waned. 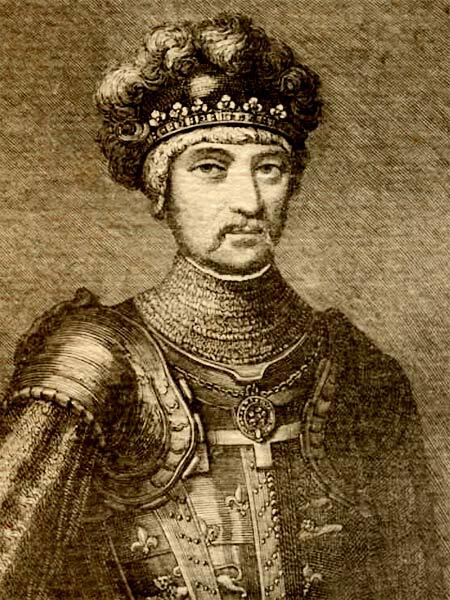 The Black Prince died in 1376 after a six year illness. "When he came home to die at the age of forty-six, with the dreams of conquest shattered and the star of England in the descent," wrote Thomas B. Costain, "he was still the idol of the commonality." 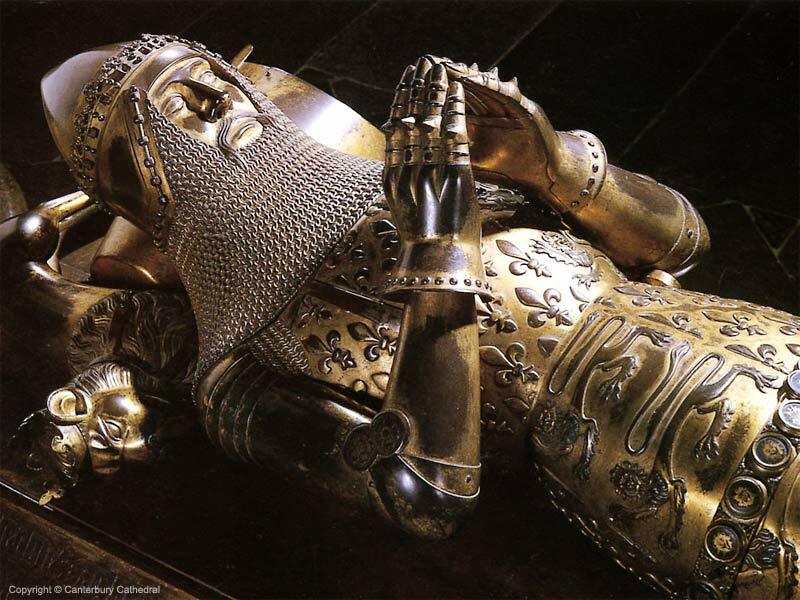 Edward of Woodstock was interred in Canterbury Cathedral in a tomb surmounted by a magnificent gilt-bronze effigy, showing the Black Prince in full battle dress. Edward left behind a rich trove of arms and armour. 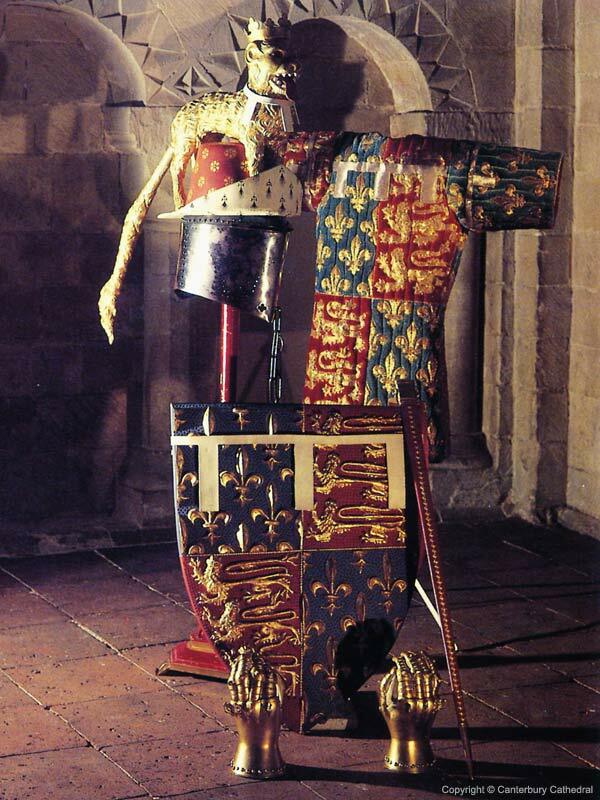 As was common in England at the time, some of his arms and armour were hung above his tomb. Scholars debate the meaning of these funerary achievements: perhaps they were a symbol that the knight had done his service to God and country, and that his weapons were no longer needed and could return to the church that had sanctified them; or perhaps they were simply a monument to the military prowess of the decedent. His helm, gauntlets, quilted surcoat, shield, and scabbard still reside in the cathedral, largely undisturbed. Replicas hang directly above the tomb, while the originals sit, safely preserved, behind glass. The Black Prince's great helm is a magnificent example of 14th century head protection and decoration. Likely designed to fit over the crowned bascinet on Edward's effigy, the iron helm is constructed of plates riveted together and has the slightly domed top popular during the time. On the right side are pierced breath holes in the shape of a crown. Cross-shaped cutouts sit along either side of the centerline at the base. Whether one or both of these are decorations or a means of attaching a chain to keep the helm from being lost is unclear. A striking feature is the inclusion of an imposing heraldic crest in the form of a leopard (a royal symbol of England to this day). Made of molded leather, it is covered with gilt and painted gesso (a substance like plaster used as a sort of primer for surfaces to be painted), much of which has not survived the ages. The effigy shows a drape covering the back of the helm that doesn't appear to have survived. A pair of hourglass gauntlets survives as well. Said to be made of gilt latten or copper, they are among the finer surviving gauntlets of the era. The finger plates survive on some digits and show spikes over the finger joints. A single removable gadling (ornaments attached to the gauntlets that act similarly to the modern brass knuckle) in the form of a leopard survives. Also displaying the heraldry of the Black Prince is his heater shield whose lack of strapping indicates it was likely made for his funeral. Made of poplar, it is covered with layers of canvas, gesso, parchment, and leather. The face is decorated with leopards and fleurs de lys, the arms of England and France that Edward III took when he staked his claim to the French throne, and punched crosses. The surviving coat armour would have been a proud symbol of status and wealth in its original condition. Made of velvet (stuffed with wool and lined with satin), it featured the red and blue quarterly arms seen on the shield. It laces up the front with eyelets and appears to have originally had long sleeves, though its sleeves currently reach only to the elbow. A decaying scabbard, sans sword, still resides in the cathedral as well. Legend has it that Oliver Cromwell, knowing the chivalric significance of the Black Prince, stole the sword he left behind during the English Civil War. A sword surfaced some years ago, "on the floor with a bundle of walking-sticks in a house-sale in 1945 or 1946," according to Ewart Oakeshott. It was in bad condition, with a portion of its sharply tapering Type XVa blade rusted off. The hilt and upper portion of the blade, however, were in better condition. The broken-off portion of the blade was used as a template by the workshop of the Royal Armouries, and a new piece was welded onto the surviving sword. The grip, originally of an unusual shape, was replaced and the pommel and guard were blackened. Oakeshott's research and study of this sword led, in his words, "inexorably to the possibility, even probability, that this [was] the sword which until the time of the Commonwealth (1649-1660) hung above the tomb of Edward, Prince of Wales, the Black Prince, in Canterbury Cathedral." While he knew he would never be able to conclusively prove this to be the case, he noted too much evidence to make "totally impossible to prove that it is not" Edward's sword. The surviving parts of the sword show the same pattern of patination as the helm above Edward's tomb, and the restored blade fits the remains of the scabbard. Its overall condition fits Oakeshott's version of the sword's history. As further proof, the sword's blade bears a maker's mark later associated with cutlers appointed to the Royal House. Compelling as this evidence may be, it was not enough to convince officials at Canterbury to take the sword back when Oakeshott offered it to them. The sword remained in his collection for many years, but has since moved into the private sector. Part of the confusion and doubt about the discovered sword's provenance could stem from the fact that it is quite dissimilar from the one pictured on the effigy. The effigial sword possesses a wide, gently down-curving cross instead of a straight one with down-turned tips. The pommel of the effigial sword, while also of a wheel form, is proportioned differently and displays a heraldic lion instead of the cross formed from four hearts that appears on the disputed sword. It should not be surprising that armourers and weapons makers have replicated the arms of the Black Prince. His helm has been reproduced by several custom armourers, including Valentine Armouries and Arms & Armor. 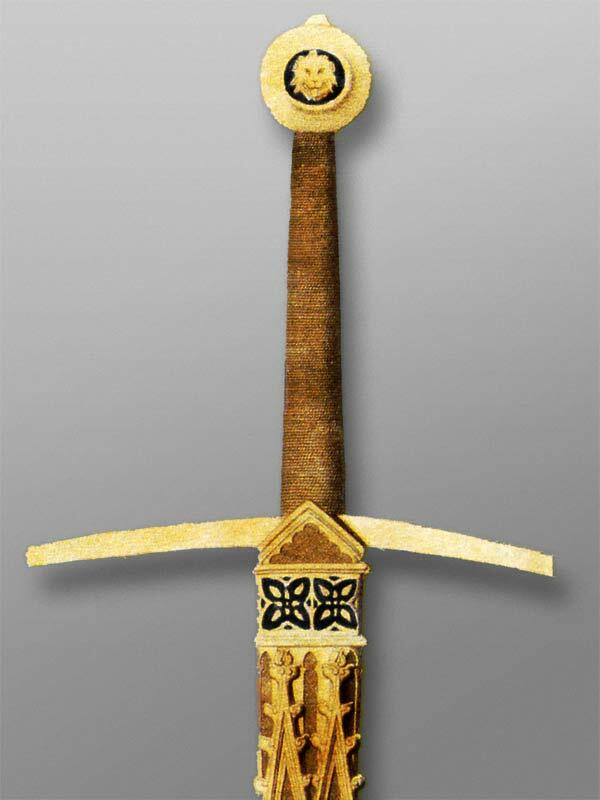 The effigial sword has been produced by custom swordsmiths on at least one occasion. The disputed sword has been re-created, in widely varying degrees of historical accuracy, by companies too numerous to list. To this author's knowledge, only the Arms & Armor Black Prince Sword used Oakeshott's notes in its design. Edward was "larger than life" in his day and was considered by many to be the flower of English chivalry. Costain describes him as "a national hero, and nothing he did... disturbed or diminished the admiration the public had conceived for him." 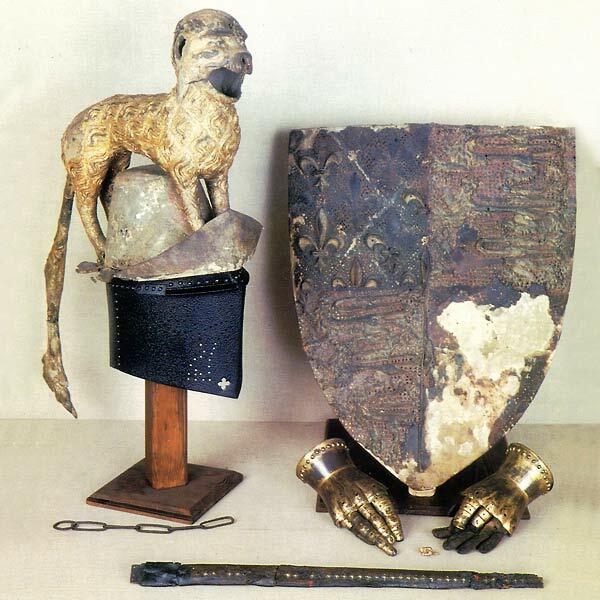 The arms and armour left behind are those of a warrior of wealth and status, thought by some to be without equal in his day, and constitute some of the finer examples of 14th century arms and armour known. Photographic copyright notices are included on each photo, when available, and especially include Canterbury Cathedral.